CDEdatablog by Centre for Development and Environment (CDE) is licensed under a Creative Commons Attribution-NonCommercial-ShareAlike 4.0 International License. Shifting water demands onto the vulnerable? Our water footprints have gone global. The drivers include modern agribusiness and the unprecedented reach of value chains. Those living where rain falls or rivers flow may give little thought to the water demands of their lifestyles. Others do not have that privilege. Worldwide, people’s water uses contribute to an increasingly complex web of “virtual” water flows implied in agricultural production, trade, and investment. This datablog entry introduces some of the water issues of global market-driven agricultural investment in developing countries. 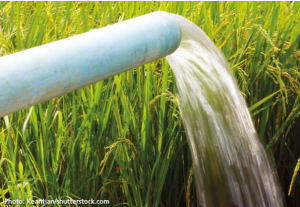 As foreign investments in agricultural land have grown, so too have concerns that wealthy investor countries might use them to take control of water resources in weaker developing countries. To clarify this, CDE researchers investigated the possible links between land investments and water resources globally and in local settings. Looking at the global level, a CDE study of several hundred land deals revealed various trends: Breu et al. (2016): Large-Scale Land Acquisition and Its Effects on the Water Balance in Investor and Host Countries. The interactive graph below depicts water flows induced by the analyzed land deals between investor countries and “host” countries. Among 475 verifiable agricultural investments analyzed by CDE researchers, a remarkable 61% of the total crop water consumption (mainly “green water”) would occur in only nine “host” countries in two distinct regions: five sub-Saharan states (Ethiopia, Mozambique, Sudan, South Sudan, and Sierra Leone, 30.6% of water consumed) and four tropical Asian countries (Indonesia, the Philippines, Cambodia, and Laos, 30.4%). Notably, these host countries face hunger problems and climate-change risks. Considered as a group, so-called investor countries may not be motivated by water resources per se. Comparing the water balances in investors’ so-called home countries with those in the “host” countries showed only a weak tendency for water-stressed investor countries to target more water-abundant host countries. But the prominence of investor countries such as Singapore, the Cayman Islands, and arguably even Malaysia, Brunei, and the USA hints at a more tangled, possibly riskier reality: many of these land deals may simply be market-driven (e.g. biofuel) investment vehicles linked to company headquarters in “investor-friendly” (e.g. low-tax) jurisdictions. Country-level water concerns (domestic or foreign) may be less of a priority than individual investor profits. 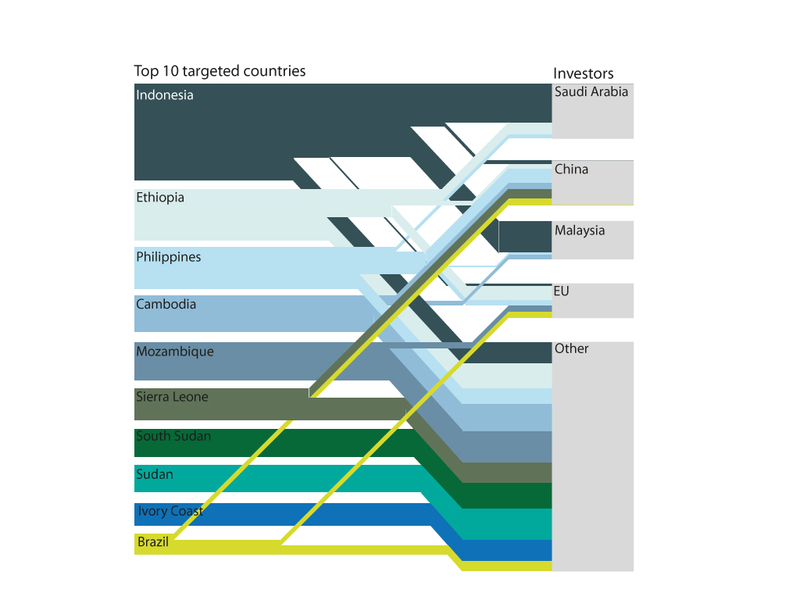 The top 10 targeted (“host”) countries and linkages to select investor countries. Infographic based on the sample used in Breu et al. (2016). Data are from the Land Matrix database which changes continually and cannot be considered comprehensive. A CDE study of large-scale land acquisitions (Tejada and Rist 2017) in Peru highlights how power imbalances shape access to water. 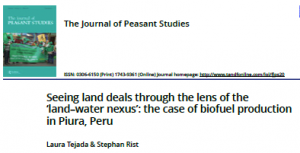 It looked at how the establishment of large sugarcane monocultures on Peru’s northern coast resulted in a massive transfer of land and “blue water” rights from smallholders to biofuel companies. A combination of neoliberal land and water reforms, the creation of a national biofuel market, and discourses about the benefits of large-scale investments helped lay the ground. Biofuel projects were given preferred access to water infrastructure built and paid for by the Peruvian state, partly with World Bank loans. Recent changes in the rules may further limit local people’s access to water. For example, new legislation rewards high-tech water-saving irrigation methods that only investors can afford. It also raises administrative hurdles (e.g. required fees and site examinations) that make it hard for small-scale users to get licences. Breu T, Lannen A, Tejada L. 2016. Shifting Water Demands onto the Vulnerable? Water Impacts of Agricultural Trade and Investment. CDE Policy Brief 10. Bern, Switzerland: CDE.